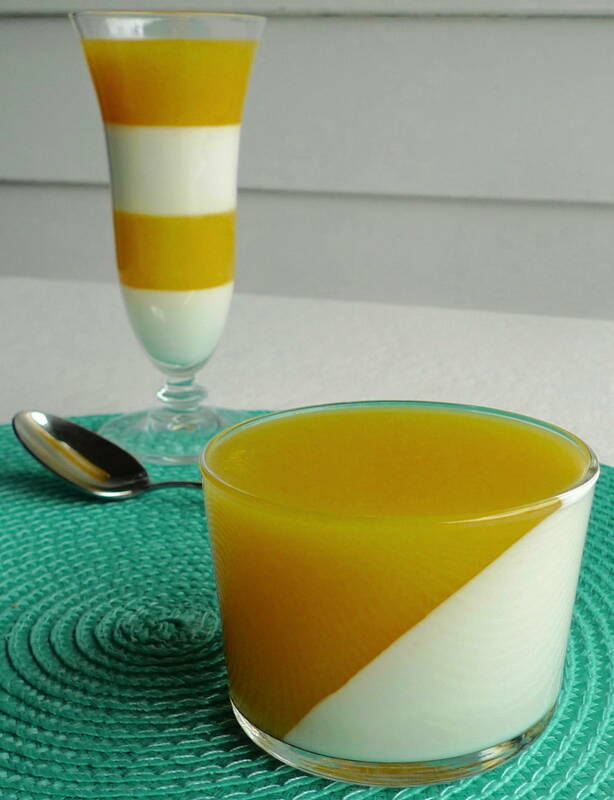 Nothing says summer to me more than the classic pairing of orange and cream. To get into the season, I made these layered gelatin desserts. The white layer is lusciously creamy, even though there is no actual cream in the recipe. And the orange juice layer gives it the perfect amount of tang and sweetness. It’s delicious and bikini friendly. 😉 That’s my kind of summer treat! I used my red, white, and blue parfait recipe, but I just swapped the cherry juice for orange. Set aside 4 serving glasses. To get the diagonal look, prop your serving glasses at an angle in a muffin tin. Pour the white layer into the angled glasses. Keeping the glasses at an angle, refrigerate until the white layer is set. In a medium bowl, sprinkle the gelatin over 1 cup of orange juice. Let the gelatin bloom. In a medium saucepan, bring the remaining 2 cups of orange juice to a boil. Once it is boiling, remove from the heat. Add the bowl with the gelatin to the hot juice and whisk well. Transfer the mixture to a container with a spout. Once the white gelatin is completely set, set the glasses upright. 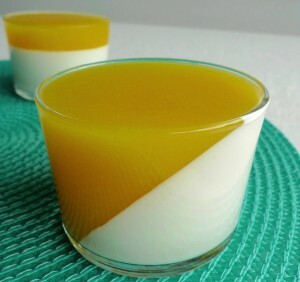 Fill the serving glasses to the top with the orange gelatin. Chill until well set, preferably overnight.